RAINIER (1885) The 51.55 ton bark Rainier was lost in the Arctic in 1885. The vessel was worth $50,000 with cargo at the time of the loss. REINDEER (1871) The 332.33 ton wooden ship Reindeer was abandoned in the ice near Point Belcher and Wainwright Inlet on September 14, 1871. The vessel had an estimated value of $40,000. Her home port was New Bedford, Massachusetts. REINDEER (1894) The 357 ton 120 foot wooden bark Reindeer was forced ashore by ice and lost at Return Reef, Midway Island at 2:00 p.m. Saturday August 4, 1894. The vessel departed San Francisco March 20, 1894 bound for whaling in the Arctic with 38 crewmen aboard. There was no cargo except for “about 40 tons of coal and casks, etc.” The crewmen attempted to hold the Reindeer by throwing out an anchor but the strong breeze and ice forced her ashore. There was no loss of life, but the Reindeer, valued at $24,000 was a total loss. There was $15,000 in insurance on the vessel. ROMAN (1871) The 358 ton wooden whaling ship Roman was crushed by the ice and lost off of the Seahorse Islands near Point Belcher September 7, 1871. The officers and crew escaped over the ice with little but their lives. 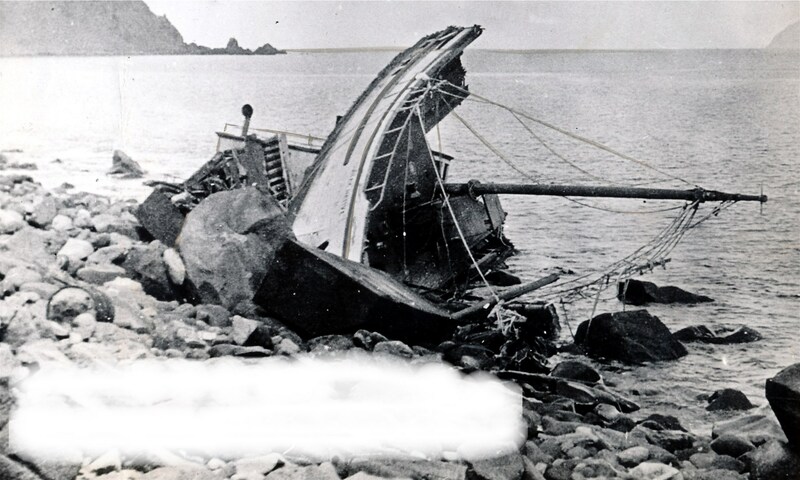 ROSARIO (1898) The 148 ton 99 foot wooden whaling schooner Rosario was crushed by ice and lost ¾ of a mile south of Point Barrow at 6:15 p.m. Saturday July 2, 1898. The crew barely had time to escape as the southwest gale forced the ice into the vessel. There were 26 officers and crewmen aboard and 80 tons of outfits and stores. The vessel and her cargo were total losses. The Rosario was valued at $3,000 and her cargo at $4,740. Vessel insurance was $850 and cargo insurance $1,750. There was no loss of life. ROSCOE (1872) The 313 ton whaling bark Roscoe was stove in by ice and abandoned off Point Barrow while at anchor August 19, 1872. The vessel departed New Bedford November 1, 1870 bound for whaling in the Arctic. The Roscoe was valued at $37,000 with her cargo of whale bone and 800 barrels of sperm oil. The cargo was valued at $18,000.